Posted on 4th February 2013 21st October 2015 By Benjamin L.
Varnish isn't the be-all and end-all of Magento performance. Its great to offset load from bots & window-shoppers - but it shouldn't be your first port of call to actually making your store faster. You also have to consider that not every store lends itself to Varnish. Any site that encourages users to create a personal session (eg. log in, add-to-cart etc.) early on in their customer journey will mean that Varnish will be ultimately redundant. For example, private shopping sites encourage user login from the on-set, however, in doing this, it means that Varnish never really has non-unique content that is cache-able. So your hit rates will be drastically low and there will be no benefit at all from using Varnish. Using Varnish effectively is all about striking a balance between stale content and the amount of visitors on your site. If you've got a busy site - odds are you can get away with lower TTLs and still have a high Varnish hit rate - and also continue to have low TTLs - thus, fresher content. So your stock/price changes are reflected quickly and the cache is continually primed from the volume of footfall. If you've got a low-traffic site - then you're going to have to make a compromise. Either increase your TTLs to ensure a higher hit rate - or have up-to-date content. You can't quite have both. Yes, you could run a crawl/spider tool continuously - but the resources this would consume, and sheer volume or URLs that can be crawled (usually in the tens of thousands for small stores) means that its simply not effective. So usually, smaller stores would benefit more from a good FPC extension and having a highly optimised server configuration. But of course I can use Varnish even when users are logged in, what about cache-per-user or ESIs? Each time the Magento bootstrap is loaded, it comes at a performance penalty of around 200ms - before it even loads a collection/renders a block etc. 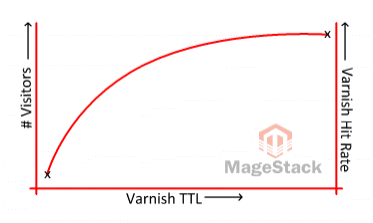 So if you've got more than 3x ESIs, odds are that you've ended up with slower page load times using Varnish+ESIs for dynamic content, than just bypassing Varnish and passing the request directly to Magento itself. So to really use ESI's effectively, you have to be able to combine multiple requests in a single request. For example, a category view page listing 20 products needs to show accurate stock levels. So you use ESI's for each block on the page. That would be 20x ESI stock requests. Whilst stock requests are very lightweight, running 20x of them simultaneously would crush performance. So instead, you could serve the whole block/collection of 20 products and just get that 1x request. But loading and rendering the collection is probably the slowest element on the page anyway - so you've not gained much. Using ESI's effectively needs proper planing and execution, or you'll have a slower site than not using Varnish at all. Then there is the alternative of using a user-specific cache. This is a bad idea unless you've got a very low-traffic site. Your hit rate will be dreadfully low - as the odds on a visitor hitting the same page they've already been to are very low. And for each customer, that 6Kb page will be occupying more and more space in your Varnish storage bin. For example, if you've allocated 1GB to Varnish. With a typical site where users view 8 pages per visit, on average 6 of those pages will be unique. So that's 28 visitors per 1MB of storage. Then factor in your images, CSS and JS - these (thankfully) will be common, but will still probably occupy a good 7-800MB of your available storage. This leaves you with 200MB of storage remaining, enough cache for 5,600 unique visitors. As the first 3 points are beyond the scope of this answer, I'll leave that to yourself to handle. Point 4 is child's play and with point 5 - continue reading. The most important thing about Varnish implementation is to ensure that you never cache content that should never be cached. But you also need to consider any custom/3rd party extensions you are also running that have custom routes, routers and namespaces. Unfortunately, there isn't an easy way to know what URLs from these extensions can and cannot be cached. So you need to evaluation each on a case-by-case basis. grep -A10 -ir "<rewrite>" community | grep "<from>"
grep -A10 -ir "<rewrite>" local | grep "<from>"
This won't give you a definitive list of URLs - but it will almost certainly give you a starter. We cannot stress how important it is to never cache content that isn't supposed to be cached. The results could be catastrophic. As with any other Magento server performance optimisation, implemented and tuned correctly can really yield benefits. But merely dropping in the software without properly configuring it is not only going to make your store no faster, but potentially slower, more insecure and less reliable.